Train is an American roots rock band from San Francisco, formed in 1993. The band currently consists of Patrick Monahan (vocals), Jimmy Stafford, Luis Maldonado (guitar), Hector Maldonado (bass, vocals), Drew Shoals (drums), and Jerry Becker (keyboards, guitar). As of the summer of 2016, original member Jimmy Stafford (lead guitar) is currently in the band, but has decided to take some time off from full-time touring and is making select appearances with the band. With a lineup that included original members Monahan, Stafford, Scott Underwood, Rob Hotchkiss and Charlie Colin, the band achieved mainstream success with their debut album Train, which was released in 1998 with the hit "Meet Virginia". Train's 2001 album, Drops of Jupiter contained the lead single "Drops of Jupiter (Tell Me)", which won two Grammy Awards in 2002. The album was certified double platinum in the United States and Canada and remains the band's best-selling album to date. In late 2009, Train released the album Save Me, San Francisco, from which the album's three singles—-the RIAA 6x Platinum-certified international hit "Hey, Soul Sister", "If It's Love" and "Marry Me"—-reached high positions on the Billboard Hot 100 at numbers 3, 34, and 34, respectively. The album itself has been certified gold by both the RIAA and ARIA and has sold 954,000 units. Since 2008, Jerry Becker (guitar, keyboards, backing vocals) and Hector Maldonado (bass, guitar, percussion, backing vocals) have been touring and recording with the group around the world. In May 2012, Nikita Houston (backing vocals, percussion) and Sakai Smith (backing vocals, percussion) also became touring members Train. 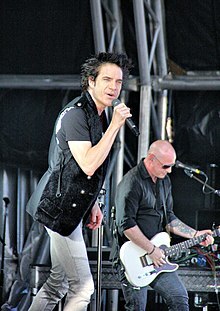 In April 2012, Train released their sixth studio album titled California 37. The first single from the album entitled "Drive By" reached number 10 on the Billboard Hot 100 and was a Top 10 hit in the UK, their first Top 20 single since 2009. In June 2014, Scott Underwood left the band, and was replaced by Drew Shoals. Train released their seventh studio album titled Bulletproof Picasso in September. It reached number 5 on the Billboard Top 200 and received positive reviews from critics, but only the single "Angel in Blue Jeans" entered the Billboard Top 100. Shortly after the band's tour for Bulletproof Picasso, Train released a Christmas album exclusively on Amazon Music titled Christmas in Tahoe in November 2015. The album features 15 songs, which included covers of classic holiday hits and three original songs. In June 2016, Train released the album Train Does Led Zeppelin II, in which they covered rock band Led Zeppelin's second album in its entirety. The band's tenth studio album, titled A Girl, a Bottle, a Boat, was released in January 2017. Train is the band's eponymous debut album. After initially being rejected by Columbia, another of the label’s A&R staff, Tim Devine, picked up the band but signed them to a sub-label, Aware Records. The album was released on February 24, 1998, with a different track listing from its independent counterpart. It was self-produced for $25,000, and three singles from the album were released. The first single released, "Free", was a large hit on pop/mainstream rock stations. The second single, "Meet Virginia" was a top 20 hit on the Billboard Hot 100, peaking at number 20, and the third single was "I Am". The album brought the band national fame, and was certified platinum by the RIAA. Following the success of the debut album, the band began working on their second album. In 2003, Rob Hotchkiss left the band citing creative differences. According to band interviews, Hotchkiss resented being pushed away as a songwriter and decided to leave. Hotchkiss started pursuing a solo career, after having contributed to six of the 11 songs on the (at the time) upcoming album My Private Nation. His solo album, Midnight Ghost, was released in 2004. "Drive By" was released worldwide on January 10, 2012. It peaked at number ten on the Billboard Hot 100, as well as reaching Platinum certifications in Australia New Zealand, and the United States. In November 2013, Train announced plans for a new album to be released in the summer of 2014. On May 5, 2014, guitarist Jimmy Stafford tweeted: "An anagram of the first single from the new @train album is now available! SGIJANNULAEBENEL. Yep." which fans quickly deciphered and replied "Angel in Blue Jeans". On June 5, 2014, Scott Underwood posted a message thanking fans for their support as he leaves to pursue writing, producing, and other music-related ventures. He had been in the band for 20 years, and has been replaced by Drew Shoals. At the time of release, the only original member's left were Pat Monahan and guitarist Jimmy Stafford. On June 9, 2014, it was announced that the album would be titled Bulletproof Picasso. The album is led by the single "Angel in Blue Jeans" written by the Norwegian Duo "Espionage". It was released the same day as the album's announcement. The single peaked at number 79 on the US Billboard Hot 100 and at number 8 on the US Adult Top 40 (Billboard). The rest of the album was released on September 12, 2014 in Germany and Australia, September 15, 2014 in France, and September 16, 2014 in the United States. The album peaked at number five on the Billboard 200. In June 2016, Train released their first cover album, and ninth overall studio album, titled Train Does Led Zeppelin II. The album was made available via download, compact disc, and vinyl record album mediums of media. The album was a song by song replication of the classic 1969 Led Zeppelin album. The band's website announcement stated: "We're paying homage to one of our biggest musical inspirations with the release of Train Does Led Zeppelin II. All of the band's proceeds from this release will support Family House." The band also launched a brief club tour that same month to support the album. Gigs included New York, Los Angeles, Seattle and the final date in San Francisco. The sets consisted entirely of Led Zeppelin covers, and featured no regular band material. They also appeared on Jimmy Kimmel Live on June 10 and played "Heartbreaker" and "Living Loving Maid (She's Just A Woman)." The album peaked at number 71 on the US Billboard 200. Beginning with live performances on tour in August 2016, Train performed a new song, titled "Play That Song". It was officially released on September 29, 2016 as the lead single to their tenth studio album, A Girl, a Bottle, a Boat, which was released four months later on January 27, 2017. "Play That Song" uses the melody from the 1938 song "Heart and Soul". On October 8, 2016, lead guitarist Jimmy Stafford posted on Twitter that he has left the band at least temporarily. Although he performed "Play That Song" and other new songs from the album prior to its release, he is not on the new album. Stafford quoted on Twitter that "We're both in a great space. Pat is making the records he wants to make and I'm still around." He has stated he will be part of the annual Train cruise "Sail Across the Sun" in February 2017. On December 1, 2016, the album was made available for pre-order and the track listing was revealed. On the same day, the song "Working Girl" was released as the first promotional single from the album. The second promotional single, titled "Lottery," was released on December 16, 2016. Just under a month later, the third promotional single from the album, titled "The News," was released on January 13, 2017. On January 19, 2017, along with releasing the fourth promotional single from the album titled "Drink Up", Train announced the official tour for the album titled the "Play That Song Tour". The tour is scheduled to occur from May 12, 2017 to July 15, 2017, and will feature two opening acts: O.A.R. and Natasha Bedingfield. On April 3, 2017, Jimmy Stafford posted on Twitter that he will not be part of the Play That Song Tour. He posted that his absence wasn't his call and that he would have loved to been part of the tour. Train supported Little Kids Rock along with COUNTRY Financial through the Road Trips and Guitar Picks campaign. In addition to raising money and autographing a guitar for auction, Train met with and sang “Hey, Soul Sister” with a some Little Kids Rock students in Atlanta. "Calling All Angels" became an unofficial anthem of the Los Angeles Angels of Anaheim baseball team; it was played at Angel Stadium before every game during the 2010 season, while the video screen showed a montage of the team's history. ^ Train's performance will be taped on April 29, 2017, and will broadcast on April 30, 2017. ^ Stafford was a full-on member of the band from 1994–2006 and 2009–2016. However, since 2016, he has only been a part-time member of the band. ^ Bonfiglio, Jeremy D. (July 13, 2014). "Train a combination of seasoned musicianship, sense of fun". The News-Dispatch. ^ Zemler, Emily (September 14, 2009). "Train Tries To Follow A Massive Hit – Again – on 'California 37'". Billboard.com. Prometheus Global Media LLC. Retrieved April 27, 2012. ^ Gary Young (September 23, 2014). "Train rolls in to the Birmingham NIA". birminghammail. Retrieved July 19, 2015. ^ Greene, Andy. 2010. "Rock & Roll: Checking in - Train Roll into New Decade with Unlikely Comeback Hit." Rolling Stone, February 18, 17. ^ a b "Train Album & Song Chart History". Billboard.com. Retrieved April 27, 2012. ^ "iTunes – Music – Drive By – Single by Train". itunes.apple.com. Retrieved October 17, 2012. ^ "Top 100 Music Hits, Top 100 Music Charts, Top 100 Songs & The Hot 100". Billboard.com. Retrieved May 17, 2012. ^ Lipshutz, Jason (February 7, 2012). "Train To Release 'California 37' Album in April". billboard.com. Retrieved October 17, 2012. ^ "California 37 by Train – Preorder on iTunes". itunes.apple.com. ^ Lamb, Bill. "Train – "50 Ways To Say Goodbye"". About.com. Retrieved August 2, 2013. ^ "Train". billboard.com. Retrieved July 19, 2015. ^ "Band demanding removal of song from site". Gaynz.Com. July 30, 2012. ^ "Train's "Mermaid" Video to Debut Monday with "Hawaii Five-0" Star – Music News – ABC News Radio". Abcnewsradioonline.com. February 22, 2013. Retrieved July 7, 2013. ^ "Carly Rae Jepsen and Train Refuse to Perform at Boy Scout Jamboree | TIME.com". Newsfeed.time.com. March 5, 2013. Retrieved April 26, 2013. ^ Bennettsmith, Meredith (March 4, 2013). "Train Won't Play At Boy Scouts Jamboree Unless BSA Lifts Ban On Gay Scouts, Band Says". Huffingtonpost.com. Retrieved April 26, 2013. ^ "Mermaids of Alcatraz Tour – Train". Savemesanfrancisco.com. Retrieved July 7, 2013. ^ "Train Tour 2013 "Mermaids of Alcatraz Tour" with The Script and Gavin DeGraw Tickets Dates and Schedule Available at Doremitickets.com". PRWeb.com (Press release). February 8, 2013. ^ "Ashley Monroe will be joining us on our Mermaids Of Alcatraz Tour! – Train". Savemesanfrancisco.com. March 5, 2013. Retrieved April 29, 2013. ^ Stafford, Jimmy. "8:30 AM -May 5, 2014 (An anagram of the first single from the...)". Twitter. Retrieved June 7, 2014. ^ "A message from Scott". Savemesanfrancisco.com. June 5, 2014. ^ "Train drummer, Scott Underwood leaves the band…". i106 Hits. May 22, 2014. Retrieved June 7, 2014. ^ a b Bienstock, Richard. 2014. "Train, Bulletproof Picasso." Billboard - the International Newsweekly of Music, Video and Home Entertainment, September 20, 76. ^ a b Columbia Records (April 20, 2011). "Grammy Award Winners Train Premiere New Single 'Angel In Blue Jeans' On Howard Stern Show Today – Yahoo Finance" (Press release). Yahoo. PR Newswire. Retrieved June 9, 2014. ^ "Train - Bulletproof Picasso - Amazon.com Music". amazon.com. Retrieved July 19, 2015. ^ Graff, Gary (May 14, 2015). "Train Is Recording a Christmas Album: Hop Aboard the Polar Express". Billboard. Prometheus Global Media. Retrieved July 16, 2015. ^ McIntyre, Hugh (October 16, 2015). "Train Are Releasing Their Christmas Album Exclusively On Amazon". Forbes. Forbes, Inc. Retrieved October 21, 2015. ^ Dresdale, Andrea. "Train to Release "Led Zeppelin II" Album June 3; Sets Club Tour, "Jimmy Kimmel Live!" Appearance". ABCNewsRadioOnline.com. Retrieved October 22, 2016. ^ Train [Train] (December 1, 2016). "Excited to announce that our new album 'a girl a bottle a boat' will be out on 1/27. You can pre-order it now fanlink.to/agirlabottleaboat" (Tweet) – via Twitter. ^ "Train Debut New Single 'Play This Song'". Radio.com. Retrieved October 11, 2016. ^ "jimmy stafford on Twitter: "It's all good. We're both in a great space. Pat is making the records he wants to make and I'm still around. I'll see you all on the cruise. "". Twitter. October 8, 2016. Retrieved November 5, 2016. ^ "Jessica Santangelo on Twitter: "@jammalama @KingArthur2115 I think my heart just broke a little, okay a lot đ&#x;˜ž"". Twitter. October 8, 2016. Retrieved November 5, 2016. ^ Train [Train] (December 1, 2016). ""Working Girl" is the next song you'll hear from the album. Here's the video for it, it's one of my favorites" (Tweet) – via Twitter. ^ Train [Train] (December 14, 2016). "Next song from #agirlabottleaboat, "Lottery" comes out Friday! You'll be able to download/stream it everywhere by 12am EST." (Tweet) – via Twitter. ^ Train [Train] (January 11, 2017). "Are you seeing this? "The News" out everywhere Friday." (Tweet) – via Twitter. ^ Jimmy Stafford (April 3, 2017). "Since I won't be on tour with @train this summer, maybe I should record some of the music I've been writing. Just a thought." (Tweet) – via Twitter. ^ "Singer Steven Tyler attends the MTV Icon tribute honoring the rock... | WireImage | 811840". WireImage. Retrieved April 26, 2013. ^ "Train Featured on CSI: New York | Fender News & Tech Talk | Fender Guitar". Fender.com. December 17, 2009. Retrieved April 26, 2013. ^ "Concierto de Shakira en Bogotá – Noticias de Entretenimiento, Espectáculos, Arte y Cultura en Colombia". Eltiempo.Com. Retrieved July 6, 2011. ^ Nolte, Carol; Kane, Will (April 8, 2011). "Fans go giddy with joy as Giants start game". SFGate.com. Hearst Communications. Retrieved July 23, 2012. ^ Marr, Madeleine (December 30, 2011). "Train to headline Orange Bowl halftime show – People". MiamiHerald.com. Retrieved April 27, 2012. ^ "Pat Monahan of Multiplatinum, Grammy-Winning Group Train to sing National Anthem for 54th annual Daytona 500". Daytona International Speedway. February 17, 2012. Retrieved April 27, 2012. ^ ""Drive By" on Letterman – Train". Trainline.com. March 27, 2012. Retrieved April 27, 2012. ^ "The web's hottest cam girl – The Howard Stern Show". Howardstern.com. March 27, 2012. Retrieved April 27, 2012. ^ "Martina McBride and Pat Monahan perform during wedding at Academy of Country Music awards". Newsday.com. Retrieved April 27, 2012. ^ Graham, Mark (April 18, 2012). "Tuned In: Train Does A Dancing With The Stars "Drive By," While We Say A Fond Goodbye To Gavin DeGraw – | VH1 Tuner". Vh1.com. Retrieved April 26, 2013. ^ "NBC's New Year's Eve – All Bios – Newest – NBC Official Site". Nbc.com. Retrieved April 26, 2013. ^ "Today Summer Concert Series 2013". NBC Universal. May 3, 2013. ^ a b "Rock band Train makes tracks in wine world". Fox News. May 3, 2012. Retrieved July 7, 2013. ^ "Train". Little Kids Rock. Retrieved July 19, 2015. ^ "One Tree Hill Music – #1.06 Life in a Glass House". www.oth-music.com. Retrieved April 26, 2013. ^ "One Tree Hill Music – #8.13 The Other Half of Me". www.oth-music.com. Retrieved April 26, 2013. ^ Voss, Erik (January 28, 2013). "'SNL' Review: Adam Levine Hosts a Stellar Night". Splitsider. Retrieved April 28, 2013. ^ Dresdale, Andrea (January 28, 2013). "Train & John Mayer Approve of Adam Levine's "SNL" Sketch Poking Fun at Them". ABC News Radio. Retrieved April 28, 2013.